Google for Jobs has big implications for websites in this sector. On one level it could hurt market share and on another level, if they leverage Google for Jobs correctly, it will result in more traffic. The phrase “Just Google it” now applies to jobs. The company announced its new Google For Jobs feature at May’s annual I/0 for software developers. The new search feature sorts and collects millions of job listings from all over the web to simplify the process for job seekers. With this unveiling, Google ultimately hopes to bridge the gap between matching available candidates with the right jobs. It began with the Cloud Jobs API. In November 2016, Google announced the new technology, designed to make it easier for companies to find more relevant candidates for their job listings. The API was originally intended for job boards, career sites, and applicant tracking systems, and was designed to address the gaps between job titles, job descriptions and desired skills. The API is accessed through Google Cloud, and can be purchased by companies to help them recruit better candidates on their job boards and websites. So far, over 4.5 million people have interacted with the API. But Google didn’t stop there. Google for Jobs combines the Cloud Jobs API with its powerful search engine features and puts it in the hands of job seekers. It’s Google’s own job search, and the tech giant’s answer to sites like Monster and Glassdoor. Traditional job recruitment sites rely on advanced algorithms to match job seekers with jobs in their area of interest. But many seekers still start with Google. Which is why the organization opted to create its own ultra job search query that allows users to search through multiple job recruitment sites at once. Google partnered with sites like CareerBuilder, LinkedIn, Monster, Facebook, Glassdoor and more to populate the new feature and increase job matching efficiency. Google is all about connecting people with the most relevant information. Turns out, their approach to the job search is no different. By working with major job sites like Monster and Careerbuilder, Google allows users to see job listings from these sites and others as soon as they’re posted, while eliminating any duplicates. That means no more checking multiple sites or scouring papers. Just Google it. Job searches have been notoriously hard for search engines to list due to the vast number of keywords and descriptions used to describe job details and titles. Google hopes to alleviate the problem with its AI and expertise in the search industry. 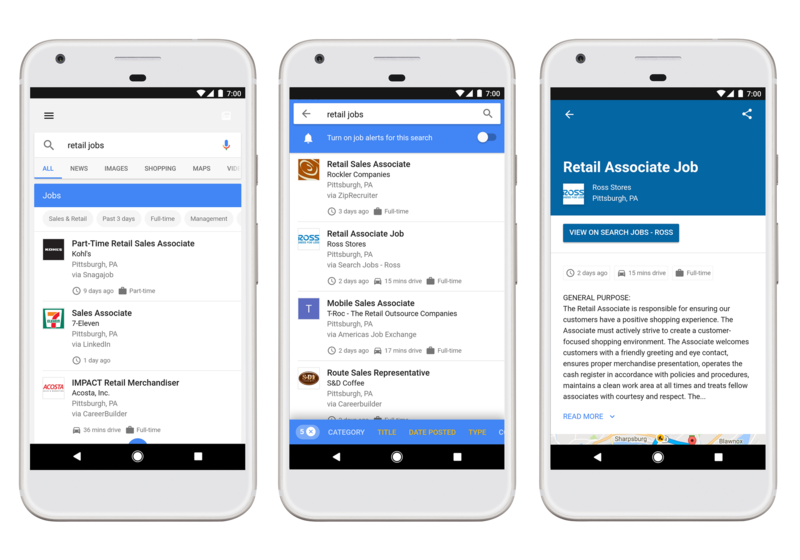 Because a retail job can include anything from store manager to store clerk, Google uses its AI to classify jobs and match patterns, supplying job seekers with more accurate results. Google also allows you to stay up-to-date on your search with its alert system. Turning on alerts for a saved search alerts Google to email you when new jobs arrive that meet your designated criteria. It’s as easy as a Google search. First, launch Google and type in “jobs.” A blue-bordered “Jobs” box will appear with a few sample entries. Click the more jobs arrow to pull more results. Once you’ve entered the Google For Jobs screen, a scroll bar will appear on your left with all possible matches, including when the job was posted and if it’s full or part time. Click on any to expand. Once you’ve entered the Google For Jobs screen, a scroll bar will appear on your left with all possible matches, including when the job was posted and if it’s full or part time. The description box for each listing includes a full job description, and underneath any available position reviews from sites like Glassdoor and Career Bliss. Google’s advanced filters are located on the top scroll bar. They allows you to sort by category, title, city, date posted, type, company type and employer. So, if you’re searching for “retail jobs,” you can narrow your options in the category filter by sales & retail, management, customer service, admin & office, etc. Google’s advanced filters are located on the top scroll bar. Or you can search by job title by choosing the title filter and selecting anything from hourly associate to retail management or security officer. The job type filter lets you specify if you’re looking for full-time, part-time, contractor or internship position. If you know the particular industry you’d like to work in, the company type filter will provide options like manufacturing, textiles and apparel, wholesale, computer services and more. All of these filters work to streamline your search and provide you with the job openings that most closely match your ideal position. So if you know that you’re looking for a retail job, specifically a customer service position at a computer store with an hourly wage, you can search for those exact parameters. If you don’t know the particular industry in mind, you can narrow your search by location. Simply type in “jobs near me” or “jobs in irvine, ca” to pull a range of jobs in your desired locale. If you don’t know the particular industry in mind, you can narrow your search by location. Each post includes a direct link to the company or listing site where job seekers can apply to the open position. Bonus filter: Google has announced its intention to include a commute filter, so job seekers can search based on the seldom-addressed but very important commute time factor. The new feature doesn’t just benefit job seekers. Employers are finding it easier to match qualified applicants as well. Google’s answer to the problem began with the Cloud Jobs API, and now continues with Google For Jobs. To get your job listings to rank higher in Google job searches, the company has released comprehensive information on what exactly developers need to do. Submit a sitemap (or RSS or Atom feed) with a <lastmod> date for each listing. If you have more than 100,000 job postings or more than 10,000 changes per day, you can apply to use the “high change rate” form here. Google also includes a Structured Data Testing tool, which allows users to validate their markup and preview their listing. If you need help setting this up for your website, contact us here. To optimize the experience, users will be able to track the success of their job listings. In the coming weeks Google promised to include a job listings feature in the Search Analytics report in the Search console so users can track clicks and impressions of their listings. If you are a job site, get on Google For Jobs fast.